So as it turns out, my protestations over hospitalizing Daxter because of cost were for naught. ‘Cause, you know, he ended up in the doggy hospital anyway and I feel like a terrible person for delaying the inevitable. The latest update is that if he can keep down food and water he might be able to come home around noon. So in order to distract myself from the fact that my little guy spent the night in a hospital bed… cage… thing… instead of being curled up awkwardly on top of my laptop as I try to type this (CRY. ), I wrote up another recipe. Hooray for filler! Okay, I promise that this will be the last uselessly late Thanksgiving recipe I’m going to lay on you guys… for now, haha. And to be fair, it really does translate past Turkey Day, since it’s spreadable on everything from leftover sandwiches to crackers & cheese. 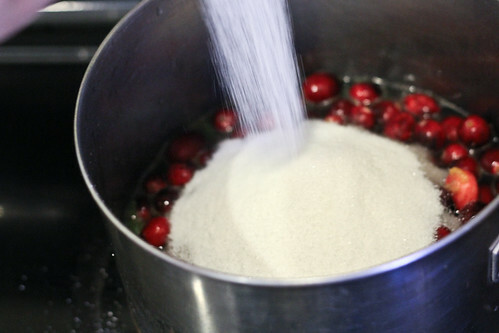 It’s a bit of a spin on traditional cranberry sauce, with as much zing as you want! Even if you’re not a huge fan of spice, the slightly bitter flavor of the jalapeño peppers and the zip of the orange and lime makes it a dish that’s so complex you’d never believe how easy it is! 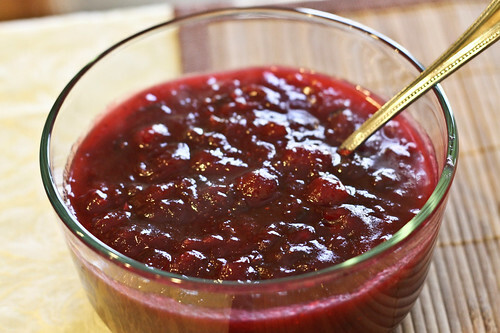 This zesty cranberry sauce will leave your tastebuds satisfied with its mix of sweet and spice. 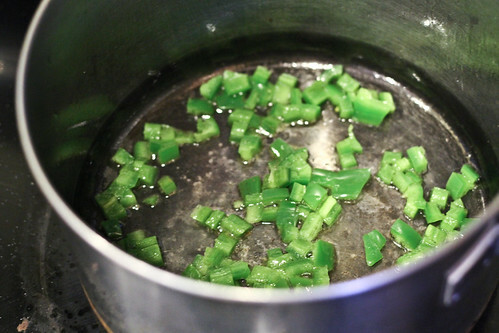 Make it hotter by including some of the seeds from the jalapeño, or downplay the spice by only using one pepper. Enjoy! 1. De-seed and finely mince the jalapeño peppers. Zest your orange and lime halves and set aside. 2. Heat a pot to medium heat with a bit of nonstick spray or a small sprinkling of oil. Add the jalapeño and heat for 30 seconds to a minute. Add lime and orange juices. 3. 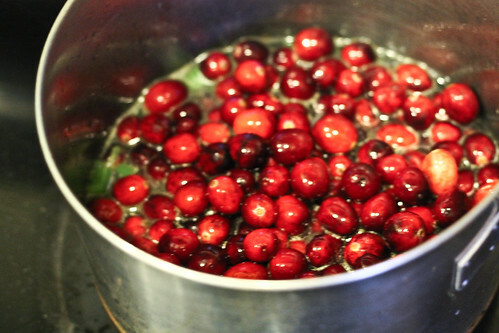 Add cranberries, water, and sugar. Bring to a boil, then reduce heat until sauce is simmering. 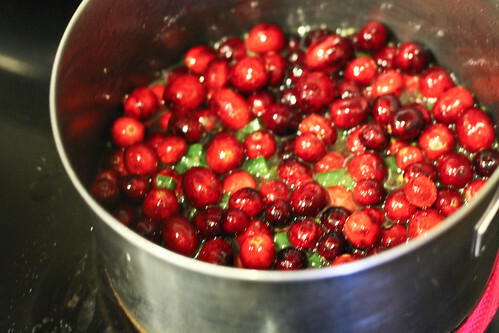 Add lime and orange zests and simmer until cranberries have burst and sauce begins to thicken, 10 – 15 minutes. 4. Remove from heat, transfer to serving bowl and let cool. The sauce will thicken and become more gel-like the longer it cools. I like my cranberry sauce cold, so feel free to refrigerate! Cranberry relish is a family tradition for Christmas, too, so you’re definitely not too late and I love this spicy twist. Although I’m a little concerned that a serving is 2 tbsp — I definitely dump 1/2 a cup or so onto my plate. 😉 Guess just because it’s a ‘fruit’ (filled with sugar, I get it) doesn’t make it low-cal haha. I know what you mean – I SMOTHER my leftovers in this stuff, haha. I guess if you wanted to experiment with cutting the calories of this you could play with using stevia or splenda or something instead? 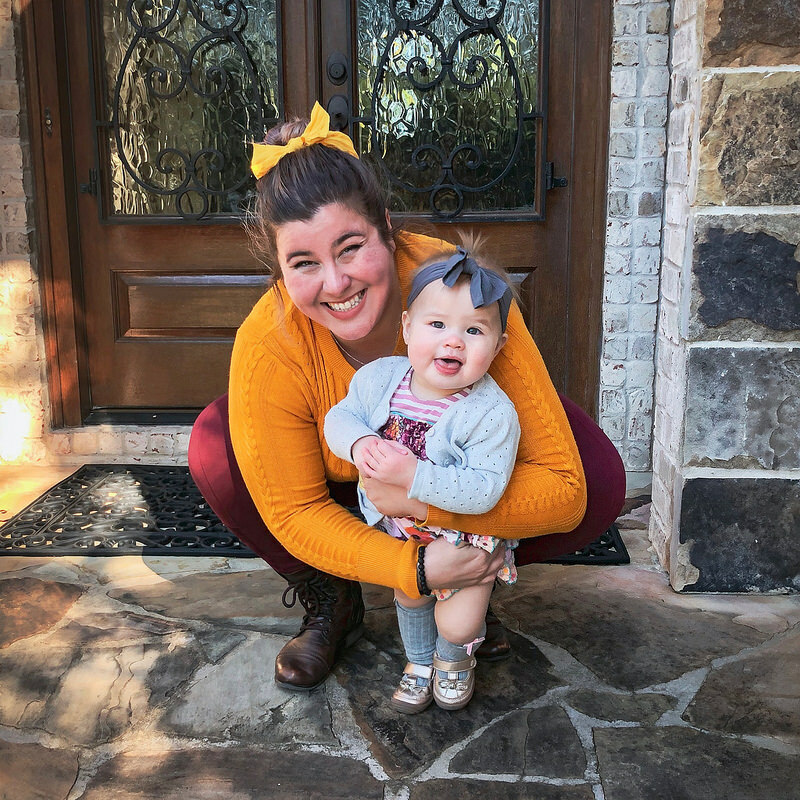 You are an amazing fur mom!!! Don’t let yourself forget this. Poor Daxter. I’m so sorry, Gretchen, but you can’t ever really know how serious something is. He might have done just fine – I think you did the right thing. He’s getting the help he needs now so that’s what matters and with any luck he’ll be home snuggled up to you where he belongs in no time! Oh, big hugs to all you guys. I know you hoped li’l Daxter would bounce back sooner, and I know how wrenching it is for a pet to be gone overnight! Even if I drop my cat off at the vet in the morning and pick her up in the afternoon, the house seems so weird when she’s gone. You guys hang in there! 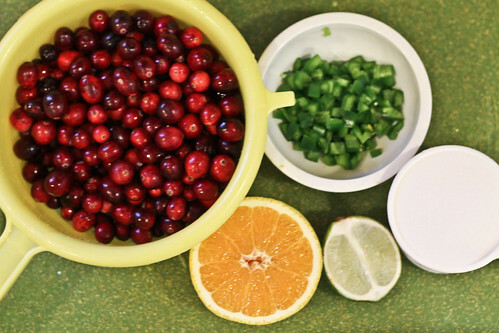 I’m always looking for something else to do with fresh cranberries – thanks for this! I made a sauce thing recently with berries, a chopped apple, and “lemon marmalade” we had on hand. It was good, but I ended up adding kind of a lot of sugar. The leftovers were basically jelly/pie filling! lol. I hope Daxter gets well soon!!! I hope Daxter is back to his old self soon! Having a sick pup is so hard!! That looks so yummy! I love the combo of heat and sweet. I hope Daxter is feeling better soon. Poor pup…don’t you wish they could talk?! Never fear! I just cooked my Thanksgiving Turkey last night–a 20lb-er that we won in our apartment drawing. I had to wait 5 days for it to thaw in the fridge, hence the late cooking. So, this recipe is perfectly timely! Yay, I can’t wait to try it!